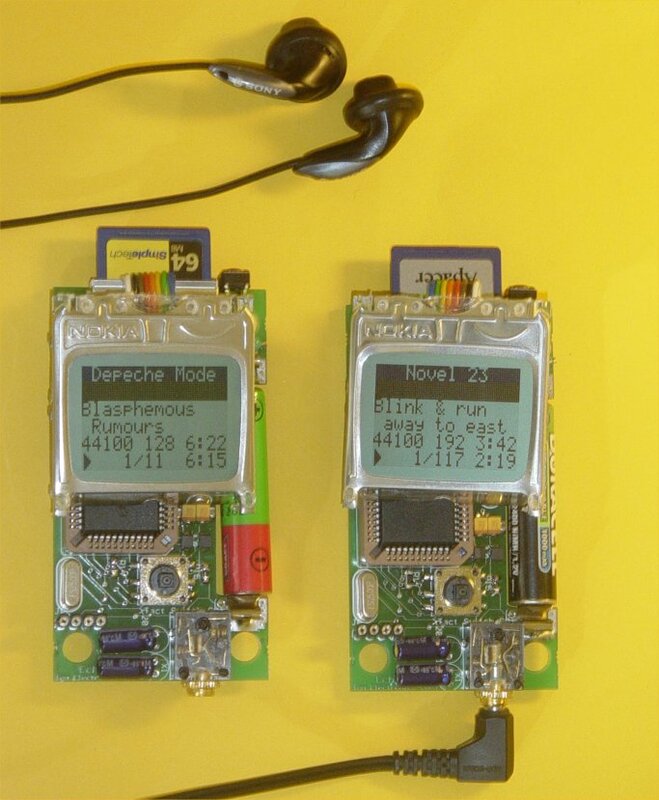 The EchoMp3 is a small DIY* MP3 player. It's cheap and of excellent quality. 64, 128, 256, 512MB and 1, 2, 4 GB MMC and SD(HC) cards used as storage. FAT (FAT16) and FAT32 supported. Low power operation with a single AAA (HR03) 1V2 Ni-Mh battery. Runs on a 18LF452 or 18LF458 at 20 MhZ. Up to 256 kBps bitrate at 44,1 kHz supported. VBR may peak at 320 kBps. Full user control (volume, track, pause, skip, directory) with a 5-way micro joystick. LCD contrast adjustable by user. Directory scrolling and file fragmentation support. Directory depth up to 10 accepted. Shuffle (random play) and extended character set enabled. New: SDHC (High Capacity) Cards now supported. Here are some compatible cards. High quality stereo DAC with a S/N ratio of typ. 87dB. THD of only 0.1% typ. Software is 100% upgradeable through an RS232 bootloader connector. Voice Recording in PCM-format with same hardware is now possible! Look here for the source code. All parts are available in our online shop. KIT versions available. 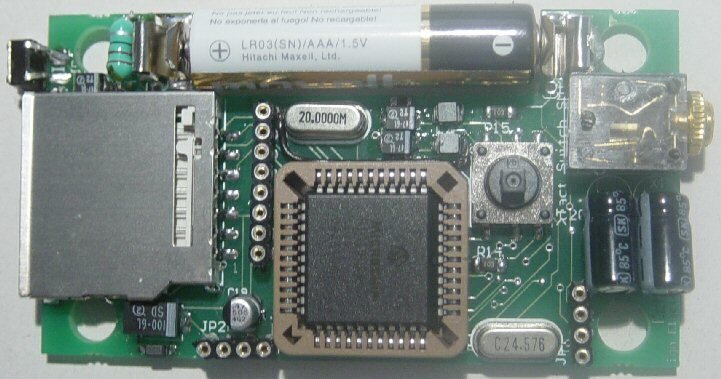 Schematic & pcb (Eagle 4.11e), hex file available. Player Software Updated on February 8, 2008. PIC18LF45x PLCC The 18LF452 or 18LF458 has to run at 20 MhZ due to the serial interface with the MMC. PLL cannot be used, cause it only works from 4V2. There's a quarter of ROM-space left for additional applications. 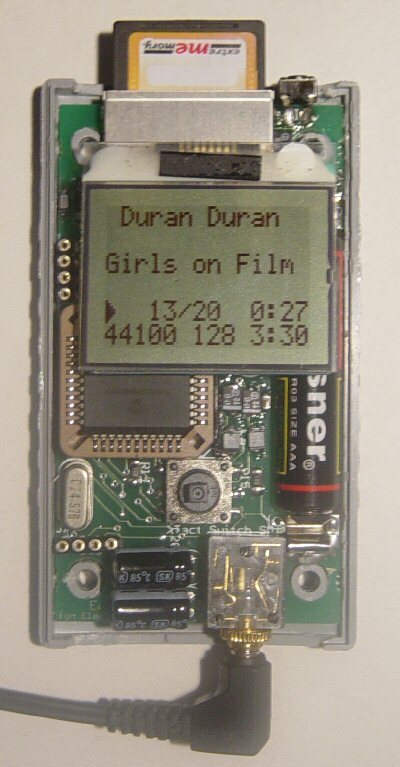 VS1002D: MP3 decoder chip. Enhanced performance compared to the VS1001K. Sounds great! Future enhancements (equalizer and so on) are possible. Thanks to GBUF, no need for large capacitors at the earphone outputs. The chip also has a recording mode! LCD The LPH7779 (Nokia 3310 LCD) does the job. First four lines are for Artist and Song Title. Fifth line is for songnumber and elapsed time. Sixth line shows sample rate, bitrate and total songtime. Contrast of the LCD can adjusted during boot: hold the vol+ or vol- pressed at power up and the contrast will change accordingly; Settings are stored into the onboard EEPROM. 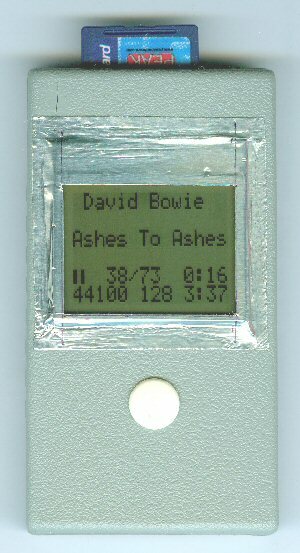 Note that the player will also work without any LCD attached. Power On/off pushbutton. The MAX1674 DC-DC step-up converter makes it possible to power the whole circuit from only one AAA battery. Some larger SD cards will not boot with a weak battery though. A 1.5V alkaline battery performs better than a 1.2V NiMh. PCB: We used as much SMD-parts as possible. Number of vias reduced to 54, only the bottom pads of the PLCC-socket need to be soldered. The PCB from our shop is a double sided and 100% connection tested PCB with plated-through-hole connections. All holes are drilled already. PCB size = 82 x 45 mm or 3"29 x 1"77. Full resolution image (GIF format). Downloads: right-click & "save as"
WARNING: may not be duplicated for any commercial use whatsoever without explicit consent from the author (c) Michel Bavin, TechDesign Electronics. Schematic: 020v1420.sch (Eagle 4.11e), June 5, 2005 and eagle_lbr.zip (Important: copy these to your \eagle\lbr directory). PCB: 020v1420.brd (Eagle 4.11e) June 5, 2005. 020_v1429.HEX (PIC18LF452 @ 20MhZ and VS1002D @ 25MhZ) October 12, 2007. 020_v1430.HEX (PIC18LF452 @ 20MhZ and VS1002D @ 25MhZ) February 8, 2008. PIC Source Code: not released, but you can buy a license on this Products page. The private life of MP3 frames. 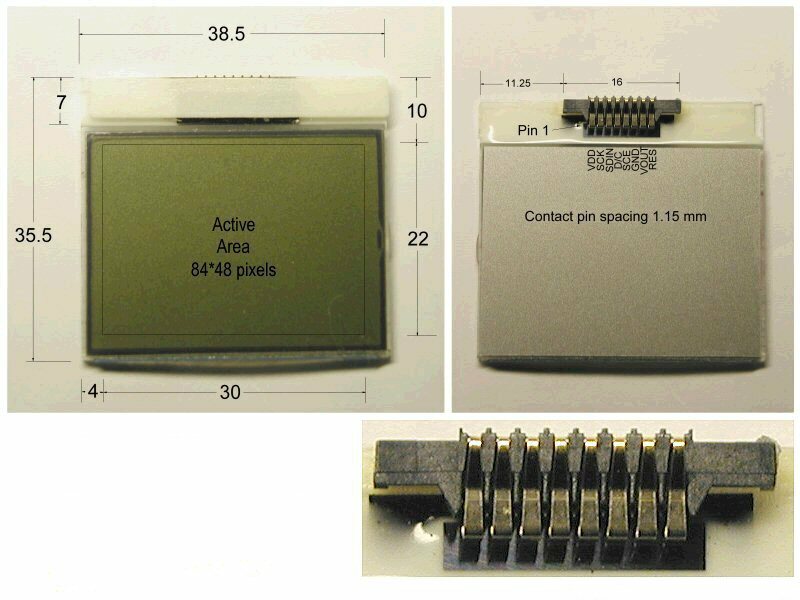 Graphic LCD module type LPH7779 (NOKIA 3310 LCD) and its integrated controller PCD8544. pin1 (closest to "JP2" print): +5V for RS232 circuit. pin3: GND for RS232 circuit. Look here to build the (very simple) bootloader hardware. The PIC code was made with the PCWH CCS compiler ($425,-); you can install Microchip's MPLAB IDE (click on the link and you can get it for free) with it to get things running smoothly. Eagle 4.11e was used for the schematic & PCB layout.